Scientists from Agricultural Research Organization in Israel have developed transgenic banana plants with longer shelf-life by reducing expression of two transcription factors. The results are published in Plant Physiology. Based on previous studies about ripening genes of tomato, Dr. Haya Friedman and colleagues characterized similar genes in banana known as the MADS box genes, MaMADS1 and MaMADS2. When the expression of these genes was repressed, the banana plants exhibited delayed ripening and extended shelf-life characteristics. The delayed ripening characteristic was linked to the production of ripening hormone, ethylene. The lines with highest gene repression did not produce ethylene and ripening was most delayed. 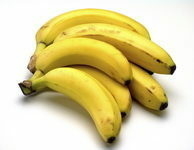 Furthermore, the quality and taste of transgenic bananas remained the same. The researchers are now working on commercializing the results to help farmers and producers. Read the research article in Plant Physiology. Watch the video about the study in Scientific American.